The selection committee of the Natalie Miller Fellowship is pleased to announce that Rachel Okine has been named the inaugural winner of the Natalie Miller Fellowship. 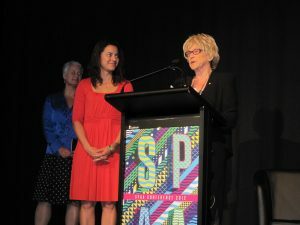 The official announcement was made at noon today, Thursday 15th November, by film producer, Tania Chambers at the annual Screen Producers Association of Australia (SPAA) conference in Melbourne, with Rachel in attendance to accept the award from Natalie Miller. 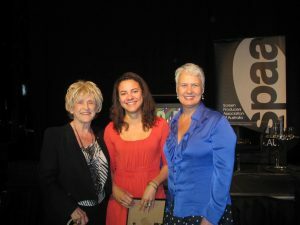 Established in 2011 in recognition of the unique contribution of Natalie Miller OAM, the Natalie Miller Fellowship aims to award a grant of up to $10,000 annually to a woman who has demonstrated initiative, entrepreneurship and excellence working in the Australian screen industries. Rachel Okine was chosen from a field which included many of the screen industry’s most distinguished professionals. The Natalie Miller Fellowship selection panel was comprised of men and women of distinction from various sections of the Australian screen and business community. Profiled by The Hollywood Reporter as one of twenty young film executives to watch in the Asia-Pacific region, Rachel Okine has 19 years’ film and television industry experience and has been employed at Hopscotch Films for over a decade. 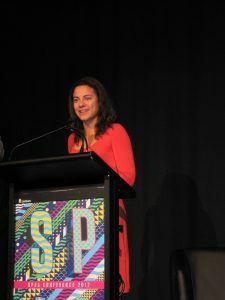 For the past seven years she has been Production and Acquisitions Executive and General Manager of Hopscotch Features. Each applicant for the Fellowship was required to submit a professional development proposal that would assist her to reach her full potential, and in doing so benefit the wider Australian screen community. Rachel’s development plan included participation in The Women’s Leadership Forum, an intensive leadership course at the Harvard Business School which recognises women with high potential and offers an opportunity for them to engage with mentors from all over the world. Rachel’s long-term goal is to become the CEO of a successful content distribution and production company. “We are delighted that Rachel has been chosen as the first recipient of Natalie Miller Fellowship, she is a very worthy winner and we are thrilled with the opportunities this Fellowship will provide for both Rachel and the future vitality and relevance of our screen industry. The Fellowship is all about recognising potential and excellence and making a truly significant contribution to nurturing the next generation of women leaders in all aspects of Australian screen culture” said NMF spokesperson Chrissy Thomson. The Natalie Miller Fellowship is open to any woman already working in the Australian screen industry, who has the potential to inspire and provide leadership. While the grant is not available for production investment, the Fellowship encourages applications from producers, distributors, exhibitors, businesswomen, entrepreneurs and others, who are seeking financial assistance in pursuing professional development in their field through attachments, internships, secondments, travel, and other means. Actor Claudia Karvan was announced earlier this year as the official Patron for the Fellowship.